The European Commission’s Directive on Data Protection went into effect in October of 1998, and would prohibit the transfer of personal data to non-European Union countries that do not meet the European Union (EU) “adequacy” standard for privacy protection. While the United States and the EU share the goal of enhancing privacy protection for their citizens, the United States takes a different approach to privacy from that taken by the EU. In order to bridge these differences in approach and provide a streamlined means for U.S. organizations to comply with the Directive, the U.S. Department of Commerce in consultation with the European Commission developed a "safe harbor" framework and this website to provide the information an organization would need to evaluate – and then join – the U.S.-EU Safe Harbor program. Please note that the form used for self-certifying compliance with the U.S.-EU Safe Harbor Framework is identical to that used for self-certifying compliance with the U.S.-Swiss Safe Harbor Framework; nevertheless, an organization is not required to self-certify to one of the Safe Harbor Frameworks in order to self-certify to the other. Organizations should also note that when they select “Switzerland” as a country from which they receive personal data, they are self-certifying compliance with the U.S.-Swiss Safe Harbor Framework. It is critically important that an organization read the U.S.-EU Safe Harbor Privacy Principles, 15 FAQs, and enforcement documents before submitting a self-certification form. Read the U.S.-EU Safe Harbor Overview. Read the U.S.-EU Safe Harbor Framework Documents. 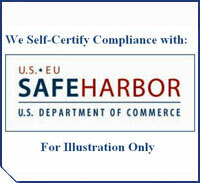 Review the Helpful Hints on Self-Certifying Compliance with the U.S.-EU Safe Harbor Framework. Review the Safe Harbor Workbook. Bring your organization's policies and practices into compliance with the requirements outlined in Helpful Hints on Self-Certifying Compliance with the U.S.-EU Safe Harbor Framework. Review the Information Required for Self-Certification. Complete and submit the Certification Form. Upon receipt of your organization’s self-certification submission and corresponding processing fee, the submission will be reviewed for completeness. If and when the submission is deemed complete, it will be posted to the U.S.-EU Safe Harbor List, available on this website.